Though Trapiche, pronounced tra-peach-chay, is intrinsic with Argentina's New World of winemaking, it's worth remembering that this iconic winery was established in 1883, making it one of Argentina's oldest wineries. When Tiburcio Benegas bought a 250-hectare property containing a small vineyard in the Andean foothills in Mendoza, and named the property El Trapiche, little did he know that it would one day be the country’s leading fine wine exporter, and one of the most famous wine names in the world. Over the 130 years that followed, the property continued to grow in holdings and prestige, receiving its first international award in Paris in 1889, and raising the standard for Argentina’s wines and the presence of malbec on the global market. Brands began to diversify and specialize, growing the international markets up until the present day. 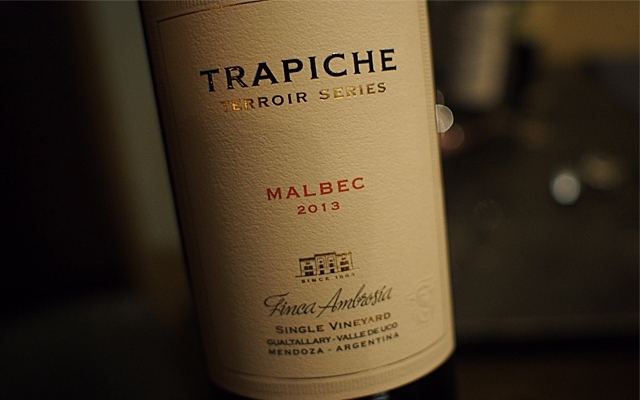 Along the way, pioneering Trapiche was credited with contributing to the introduction of French vines into the country, the production of single varietal wines, the import of French oak barrels, and the use of stainless steel tanks. More recently, and under winemaking director Daniel Pi since 2003, they have propelled the idea of working vineyards at altitude, utilizing the freshness and the maximum diurnal temperature swing for balance in their wines. They have also made giant strides into organic and biodynamic practices, with sustainability at the fore of all they do. And notably, under Pi, they’ve introduced terroir-specific and single-vineyard bottlings that highlight place and grower. Today Trapiche is sold in more than 80 countries, sourcing premium grapes from sites throughout Mendoza and across Argentina, including more than 1225 hectares of owned vines and through relationships with some 300 independent growers. The winery has long had a strong name in Canada and British Columbia, and a long history at Gismondi on Wine (we’ve published nearly 80 Trapiche notes since 1997 on the site). This fall I joined senior winemaker Sergio Casé for dinner on the night of his first ever visit to Vancouver to taste and hear about what the pioneering company is doing now. “Altitude is the new story”, according to Casé, a fourth-generation winemaker and important member of the winemaking team at Trapiche for the past 18 years. Every premium wine’s vineyard, soils, and altitude are an important part of the discussion and identity of the wine according to Casé. Together with Pi, their team is working with native ferments and concrete (including eggs) in many of their wines, decisions intended to reflect the specifics of place. One such small project, and quite interesting for a soil geek like me, is their brand new Perfiles project, where they plant a single grape on different soils, vinifying the wines the same and in a low-intervention manner, making clear the difference in soils has on the grape. Perfiles translates as “Profiles”. We tasted the Perfiles Chardonnay, grown on calcareous soils, though they also produce two Malbecs, one on calcareous soils, and the other on clay, along with a Cabernet Sauvignon on gravels, which I will be seeking out. Another project they’ve been honing over the past decade is their Terroir Series. Begun in 2003, the line was intended to honour the grape owners and their specific properties. For the first few years, the wine and name would change every year based on what was most impressive to Pi and Casé. “Over time it became clear that the same vineyards were always rising to the top” according to Casé, and today the line follows the vintage variation from the Ambrosia, Orellana de Escobar, and Suárez Lastra vineyards. Verticals of these are particularly interesting, as you can clearly observe how the vintage variation dictates the final wine. It’s key, I believe, for large scale wine brands to have small, focused projects, reminding consumers, and the winery employees themselves, that it all begins with the soils, and the vines. Based on an evening tasting these small-lot, site-specific wines with Casé, Trapiche hasn’t forgotten their humble roots, and that will continue to ground them over the next century. Below are the Trapiche wines I tried during the dinner with Sergio Casé this fall. Not all of them are currently available in the BC market.